Sprays with Bergamot oil or Lavender oil should be enjoyed within 15 months for optimum freshness. uses Pink Grapefruit essential oil. You eat no grapefruit but you get some of the detoxifying effect. Grapefruit can help with cellulite and is believed to be a mild appetite suppressant. Get the Junk Out My Trunk blend also has subtleties of fennel and cypress. Fennel is helpful in removing toxins and excess water. A touch of Cypress is added for its drying and deodorizing properties. Smells like forest, pot, sunshine, and snuggling! A great light freshwater spray with a purpose. 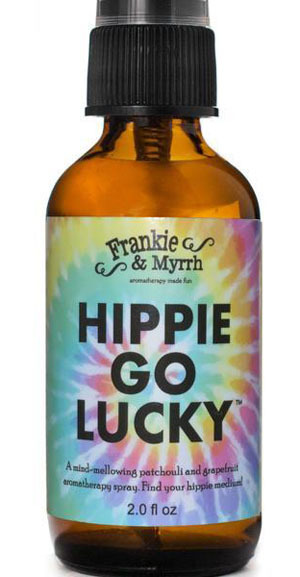 Organic Patchouli is a great mood lifter, so it's not just the marijuana keeping Hippies happy, it's the Patchouli too! Patchouli acts as a stimulant, and is a long-used aphrodisiac. The Organic Grapefruit in the blend adds a slight top note to brighten your hippie mood. When In Doubt, Use Lavender! Organic French (Food-grade) Lavender for life's many issues. 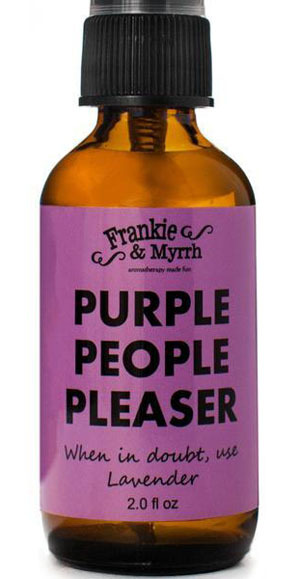 Purple People Pleaser stands alone as a most versatile spray. It is the one suggested the most for gifting. People are very, very likely to like the smell and everybody can find a use for it around the house, or on the go. Lavender is considered one of safest oils for pregnant women, children, dogs, Many customers use it as a coat/bedding deodorizer for their dogs. An Aromatherapy/ Car Freshening Spray --- Relief From Rush Hour, Slow Turners, Tailgaters, Cutter-Offers, Disorderly Detours, Psycho Cyclists, and Pushy Pedestrians. 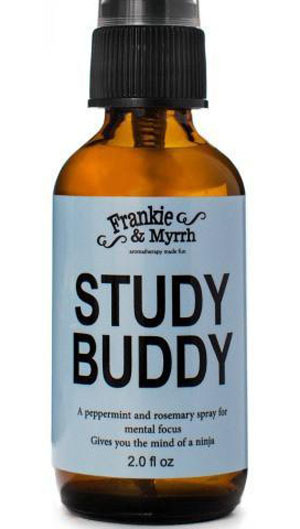 Designed as a calming car freshener, this spray smells like sweet Christmas morning. Imagine yourself in a sweet forest, calm and relaxed. If you're stuck in traffic, it may as well smell good. The #1 selling car freshener is pine. Lavender and Orange essential oils are both diffused in hospitals to keep patients calm. Balsam Fir & Black Spruce, with their sweet, light evergreen aromas are very grounding. This aroma will take you away from your angry place and transition you to the tranquility you need behind the wheel. An aromatherapy spray/ perfume for when you're irritated, pissed off, annoyed, tired, peeved, frustrated, enraged, and have an overall bad attitude! To help with PMS, hot flashes, menopausal issues, and overall general bitchiness, the two oils considered to be the best for those issues: Rose Geranium and Clary Sage. Lavender, Bergamot, and Frankincense, which all have a calming effect. **Please consult your doctor before use, if you are pregnant or have any medical condition. Avoid getting product in eyes. This product has not been evaluated by the FDA and is not intended to diagnose, cure, treat, or prevent disease.